Writing blind to last night’s events at Bramall Lane, you’d still have expected a certain level of performance from Sheffield United. If not, they’d have heard about it by now for sure. Because one of the greatest fallacies in football is that it doesn’t matter how you play, it’s only the result that counts. Managers trot it out when it suits them, knowing inwardly (let’s hope) that it’s a load of old tripe. Because in the long run you can’t have one without the other. And while we’re at it, let’s get rid of this other nonsense of “momentum” being some sort of dirty word around S2. Of which more later. From what this column has viewed so far, momentum is one of the keys to this Sheffield United season. Maintain the standard and intensity of most of what has been produced so far and the Blades can be confident of being competitive in or around the top six to the end. What they can’t afford, as Chris Wilder has admitted on more than one occasion, is to let that level drop any more than occasionally. That’s when the more expensive brand of footballer, paraded by most of their rivals, will be around to punish them. 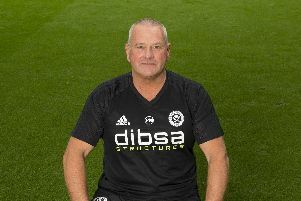 Functioning consistently at close to the maximum is imprinted large under the bonnet of Wilder’s lower budget model which, nonetheless, houses some some excellent players right through the team. What United don’t have is the luxury to perform as Aston Villa did at Bramall Lane last season when, after being second best, the class of Rob Snodgrass snatched a barely deserved late win. This time around it was an all-on team display, capped by goals at big moments, that turned the tables so spectacularly. When managers say they’ll take a result over a performance, an ugly win, it’s usually because their team is not playing well anyway. And you know what they mean. A scruffy, even lucky, three points can turn things around by lifting spirits. With the example United have set, from back to front, they ought not to find themselves in this position. And that is some statement barely into a second season in the Championship. It speaks of progress and, dare I say, momentum. I don’t go along with those who brand the liberal use of “momentum” as a slight on what Wilder and his team have achieved. The then Southend manager Phil Brown got slated for using it last season, which was grossly unfair on him in my view. To achieve momentum, you have to have played well over a period. To maintain it, you have to keep playing well. It’s a compliment, damn it. Neither does it belittle the quality in the side. So for me, momentum is something to be embraced and not rejected in some kind of huffy siege mentality. It’s a feat to achieve it and even more so to sustain it. Long may that particular force be with this team.